I LOOOOOOOOVE a steaming mug of hot chocolate. A big mug with lots of whipped cream or marshmallows. Then add on a sprinkling of chocolate shavings on top. OH YES!!! Nothing says cozy quite as nice as snuggling up with a cup of hot chocolate. Mmmm.. Cool mornings have started here in Georgia. If weathermen are correct, we should be greeted each morning with temperatures in the 40s. Great way to start off the morning? Hot chocolate and buttered toast for breakfast. This mix is super easy to prepare. I simply don't like the taste of the store-bought premade packets of hot cocoa mix. So I just keep all the ingredients I need on hand to make this and mix it all up whenever we run out. Decidedly simple. Very tasty. My girls even say they prefer this version of hot chocolate over any they've had from a restaurant. WOW!! Mix all ingredients together and store in a quart size mason jar. To make a cup of hot chocolate, pour hot water in a mug and THEN pour in the hot chocolate mix (1/3 to 1/2 half cup, based on how sweet and chocolatey you like your cocoa). Let it start to dissolve on it's own and then gently stir it all together. Great as is OR add lots of marshmallows or whipped cream. Great, also, using a peppermint stick as a stirrer!!! Sounds delicious! 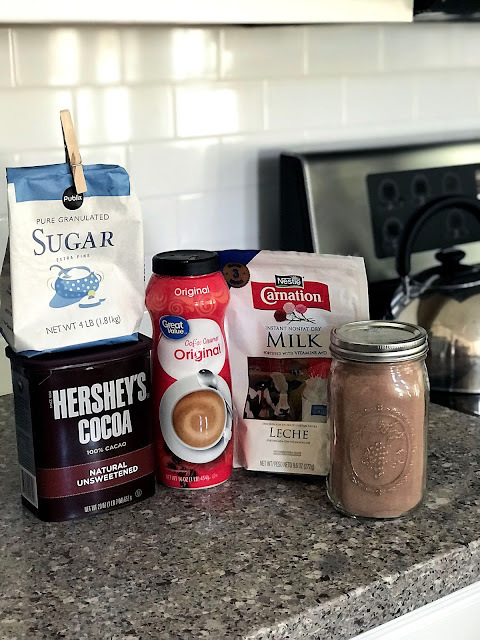 I'll have to try my hand at making some, especially since it seems I can't keep our pantry stocked with hot chocolate mix. I love hot chocolate to! We drink a lot of it here in this house. Here in the Yukon, the snow has started, and we are back to stocking some in our cupboard. We make our own as well. Never used coffee creamer...but we don't drink coffee. I put powdered milk and vanilla sugar in mine. So excited to see how easy this is to make. I will save in pinterest to try it soon. Glad I found your post at the homemaking link up today! So awesome. This sounds wonderful and your pictures are lovely! Pinning it to try later! Also in Georgia (southeast) and we are loving the changing weather! That hot chocolate looks yummy, I'll def have to make a batch. Happy Fall (finally)! I'll have to try this! 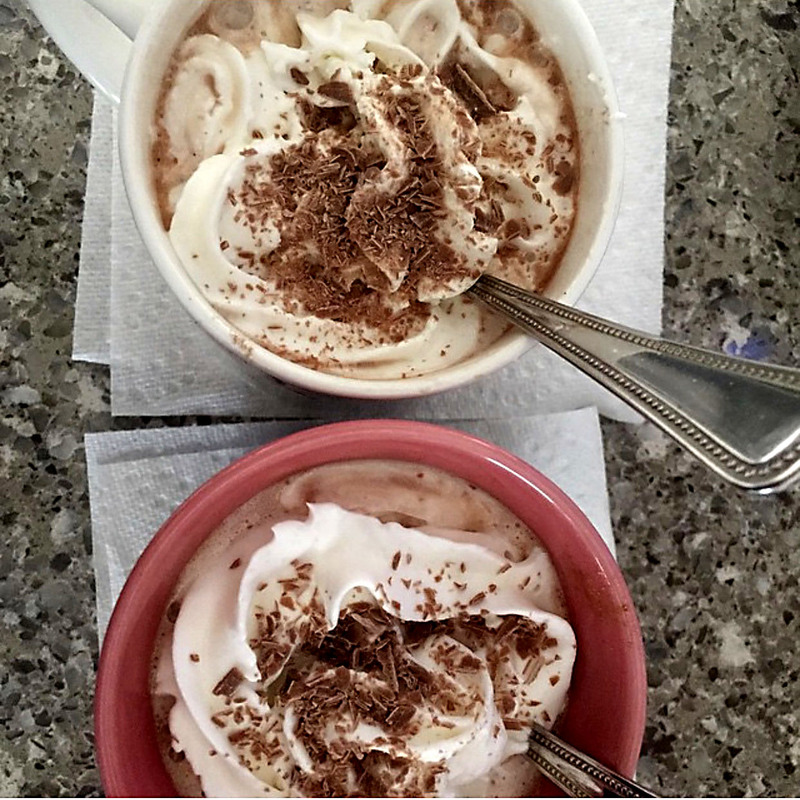 My daughter asks for hot chocolate a lot, especially now that it's getting cooler. I've never bought powdered milk before but it's always been something I've wanted to try! I would really enjoy a cup of your Hot Chocolate! Thanks so much for sharing with us at Full Plate Thursday. Have a great week and come back to see us real soon! Congratulations! Your post was my feature pick at #ThursdayFavoriteThings this week. Visit me at https://www.marilynstreats.com on Wednesday evening and to see your feature and grab your badge! All hosts choose their own features from the comments left on their blog so be sure to return to my blog for your badge. I invite you to leave more links to be shared and commented upon. Please don’t forget to add your link numbers or post title!